The ruling Justice and Development Party (AK Party) is ready to take action for the do-over of municipal elections in Istanbul, the commercial capital of Turkey, as the application file, which explains the irregularities in the election process, is about to be completed. In the following period, it is expected that the AK Party will submit an official application after the recounting of the votes in Istanbul is complete. In the application file, the AK Party will list the reasons that require the elections to be redone based on evidence and documents. Some reasons include invalid or deceased people who allegedly voted in the elections. Moreover, balloting committees in many districts were not compatible with the requirements of the law; there were empty or unsigned voting records and irregular registrations of voters. Following President Recep Tayyip Erdoğan's instruction to use all the rights that the law allows, election law experts from the AK Party put in their best effort to prepare the application file for the renewal of the elections. Büyükçekmece is the district that has triggered the most discussions on irregularities in the elections in Istanbul. Evidence and results around the ongoing investigation in the district of Büyükçekmece, records of statements and official reports on irregular voter registrations and details of the investigation conducted by the Interior Ministry will be included in the application file. The AK Party's application for the cancellation of elections in Büyükçekmece district was expected to be heard on Thursday. However, the Supreme Election Council (YSK) delayed its decision on the application, stating that the application will be evaluated with the AK Party's application about Istanbul Metropolitan Municipality elections. The AK Party is still waiting for the completion of the vote recounts in the district of Maltepe to make its application for Istanbul metropolitan municipality elections. After the completion of the recounting process, the AK Party will officially present its application file for the cancellation of the elections in Istanbul. If the YSK accepts the AK Party's appeal on the Istanbul elections, there will be no need for another decision on Büyükçekmece. Mevlüt Uysal, the AK Party's mayoral candidate in the district of Büyükçekmece and the former mayor of Istanbul Metropolitan Municipality, also made a statement saying: "In the last eight months since the June 24 presidential elections, a total of 11,954 voters have been dropped from the voter records in Büyükçekmece, and 3,092 of those do not have any record in any place. What does that mean? It is like their citizenship just disappeared. Those who vote for the AK Party have been erased from the list. Turkey has not seen such an organized operation in its history." Uysal reiterated his party's demand for the elections to be canceled. As the recounting process continues in Istanbul, 97 percent of the votes in appealed ballot boxes have been counted. The last results show that main opposition Republican People's Party (CHP) candidate Ekrem İmamoğlu leads the polls by 13,996 votes over AK Party's candidate Binali Yıldırım. İmamoğlu responded to Uysal's allegations and said: "They do not have such a legal right, and there is not population activity as declared. I underline that it is a lie. They [have] conducted a process in a way that offends the people of Büyükçekmece. They have tried to make the process in Büyükçekmece shady and have built a road map for it." Büyükçekmece Municipality Mayor Hasan Akgün also reacted to Uysal's statements "Some 4,459 voter records have been updated, and 1,964 people went outside of town. Of these 745 people are voters whose records were erased due to the appeals by both the AK Party and the CHP, and 591 people are voters who switched their address from one neighborhood to another. Therefore, there has not been voter activity including 20,000, 30,000 or 40,000 voters in Büyükçekmece," said Akgün. Meanwhile, Erdoğan and Yıldırım met in Ankara on Friday. Yıldırım made a statement on his Twitter account and said: "There are people who have misinterpreted my silence on the election process in recent days. It must be known that my attitude is an indicator of my respect for the YSK's decision process. I closely follow the process with my party and authorized bodies. Voters said their last words. Now, it is time for the YSK," implying that he pursues his determination over being the next mayor of Istanbul Metropolitan Municipality. According to unofficial results, İmamoğlu, of the Nation Alliance made up of the CHP and Good Party (İP), held a narrow 22,000-vote lead over opponent Yıldırım, the candidate of the People's Alliance formed between the AK Party and Nationalist Movement Party (MHP). 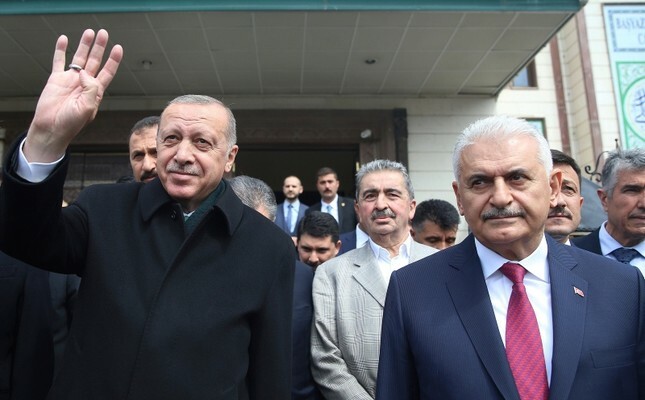 On election night, Yıldırım declared victory as he was leading in the polls by a narrow margin, only to be followed by İmamoğlu's announcement of victory. The candidates' early victory statements were followed by YSK Chairman Sadi Güven's announcement on April 1, who said İmamoğlu led the polls by almost 25,000 votes according to unofficial results. Immediately after Güven's remarks, the AK Party said that it would object to invalid votes and irregularities in Istanbul. The YSK is assigned from the start until the end of elections in order to manage the order of elections with honesty, to undertake or provide undertaking of all necessary transactions, to examine all electoral complaints and objections and to give final decisions on such complaints and to accept electoral minutes of members of the Turkish Grand National Assembly and minutes of the presidential elections. Meanwhile, the YSK recently decided to have a rerun of the local elections in the Keskin district of northwestern Turkey's Kırklareli.